In started on Easter, in the rain. That sounds hopelessly romantic, but truthfully it was a little more awkward than all that. See, neither one of us – myself or my wife, Cory – remembered it was Easter, and so therefore we hadn’t considered that the restaurant where we’d arranged to meet for our first date might be closed, which of course it was. So there we stood, two virtual strangers, in the middle of the street trying to get over the sudden hurdle of having to choose somewhere else to go. First thing I learned about my future wife: she’s even more indecisive than I am. Then it started to rain, forcing our hands forced. We chose the nearest bar, just around the corner, and relocated in separate cars. I remember pulling up to the red turn light, the straight lane green and empty. For a split-second I thought, she’s gonna keep going. I pulled in the turn lane fully expecting to hear her engine rev and her Honda Accord lurch past me driving for the hills. But there was no rev, no lurch. She followed. And we had the best first – and last – date of our lives. We went out again the next night and decided to make things exclusive. We also planned a trip to Vegas six weeks in the future. We’ve always been an impulsive couple, and almost exclusively it’s been a positive thing. We moved in together three months later, got engaged six months after that, bought our first house five months after that – the first one we looked at, the first day it went on the market, wrote up the offer on the hood of my car in the driveway – and got married four months after that. When it came to starting our family, we were a bit more paced. It wasn’t until two years into our marriage that we actively started trying. It would be another two years before we actively stopped trying. In between there were months of ovulation tracking, impromptu liaisons, multiple sperm tests, the “Clomad” days (ask a woman) hormone self-injections, and not one, not two, but three very pricey rounds of IUI treatments (intrauterine insemination for the romantics out there), none of which even came close to working. After the third IUI treatment, we were told it probably wasn’t going to work for us. The next level was IVF (in vitro fertilization), which was going to be more expensive than all three rounds of IUI’s combined, and, we were warned by our doctor, there was no guarantee it would work. Frustrated, mentally exhausted and emotionally spent, we decided to take some time off from babymaking and put some time back in to being husband and wife and not potential parents. To some of you the distinction between those two designations might be invisible, but years of your intimacy being scheduled, purposeful, unfruitful, and scrutinized by doctors, your marital va-va-voom needs a tune-up. The energy to propel our lives together into a next chapter, however, needed nothing but a new focus. In addition to failed procreation, the other thing that had been on our minds the last couple of years was moving. I’m from a small town in North Carolina, moved to Portland for work in 2005, and Cory’s from Salem, Oregon, and moved north after high school. Portland is a great place to live, a great place to raise children, and a great place in general. But we – me especially – didn’t want to stick around a city in the long-run. Neither of us had been raised in a city, we’d both grown up in tight-knit neighborhoods, her in the suburbs, me in the country, and we wanted that same kind of idyllic, wholesome, home-when-the-streetlights-come-on kind of life for our kids. We’d been idly scouting around – we knew we wanted to stay in the Pacific Northwest, but that was the only parameter – and had explored places like Astoria and McMinnville, both in Oregon, the northern coast of Washington state, and the Olympic Peninsula. We’d spend a few weeks or a few months fixated on one place until the shine wore off and we moved on to the next, just trying to find one worth the trouble of uprooting our entire lives. So far, nothing was clicking. Then one afternoon in the fall of 2014, Cory and a friend went to Hood River, Oregon, just an hour east down interstate 84, in what’s geographically known as the Columbia River Gorge, that watery border between Oregon and Washington first described in the annals of American history by famed explorers Lewis & Clark. The Gorge is a collection of small-to-tiny towns on both sides of the river nestled among the wide, cerulean swath of the Columbia, rolling green hills and vast farmland, and picturesque natural beauty at every turn. Cory came home convinced the Gorge was the place we were looking for; after a visit with her the next weekend, I was too. It was rural without being isolated, simple without being boring, slower without being lazy, a place where apple orchards lined the roads, trains rolled along the river, hiking trails forked off every thoroughfare, and the majority of businesses, restaurants, and markets were locally owned. The lots were large and the neighbors only just in sight. There were more parks than parking spaces and less fast food restaurants than fingers on one of your hands. It was as advertised: everything we were looking for. We didn’t waste any time; our impulsiveness kicked into high gear. Cory started scanning the want ads and within a week she found a job opening with a large corporation seeking an Executive Assistant for its CEO. A couple (aced) interviews and a few weeks later, she’d landed the job and a sweet relocation package with it. We’d barely decided to move to the Gorge and already we had ties there. There was no more time to think, only act. By February we were there – specifically in Lyle, Washington, 20 miles east of Hood River across the Columbia – in a beautiful log home on two acres with a back-porch view of Mt. Adams. This life we had envisioned for ourselves, this dream we’d formed in our collective imagination for years now, it was real. It wasn’t long, a few months, maybe before the conversation returned to kids. Nothing about our desire to have them had changed, but neither had anything about our desire to spend a small fortune on uncertainty. I don’t remember which one of us brought it up first – likely we brought it up at the same time – but the word “adoption” was mentioned and that was that. It made perfect sense, it was an opportunity to get what we wanted, a family, while helping a child in need. The world’s a big place and growing exponentially every year. Of the approximate 7 billion of us here on Earth, 153 million are orphaned children. That’s more than twice the number of total children in the United States. And while we’re speaking of the U.S., our foster system only provides placement for 60% of the children in its custody. That means approximately 180,000 kids living in the richest country on the planet have no home, no parents, and won’t unless they make one of their own upon being ejected into society at age 18. So, if we couldn’t make a child of our own, we’d take a child in need of a home and open ours to them. I can’t tell you why we decided to go the international route, and I’m not sure Cory could either. There’s no singular reason, no overriding philosophy or perspective that pointed us that way; the best I can say is that we wanted to help as much as we could, and the need internationally is greater. 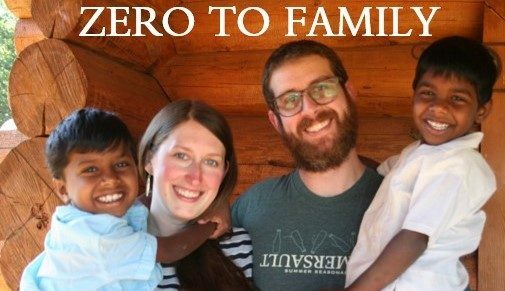 The American foster system, despite the shortcomings mentioned above, is still far and away better than systems in Ethiopia, China, Eastern Europe, or India. Here, being an orphan or a foster child is a hurdle. In other places it is a life sentence of poverty, inopportunity, discrimination, and heartache. We went where the need was greatest. Long story short – don’t worry, this is just the opening post, you’ll hear plenty about all this in time – from the point we started acting on our decision to the point we walked into our home with our boys for the very first time there were 30 months of mountainous paperwork, background checks, home visits, innumerable emails and phone calls with our agency, with social workers, with Homeland Security, and so, so, so much waiting. For this to clear so that could clear, for that to come through so this could get started. Between being matched with our boys and actually meeting them took more than a year just on its own. That’s a year of staring at their pictures on the daily and not being able to see them, hear them, talk to them, touch them, or even know them. There were months upon months where we weren’t able to do anything but wait for the phone to ring or our Inboxes to chime. We had beds made and ready that went unslept in for a year, there were clothes that stayed folded in dresser drawers and toys that sat in bins, unplayed with, books that stayed on their shelves unread, for just as long. How we got through all this, to our boys, and everything that’s happened since is what Zero to Family is all about: part adoption memoir, part parenting crash-course, part hilarious trainwreck in motion, all we’re aiming to do is share our experience in the hope that other adoptive families, at whatever stage, can find some kinship, camaraderie, and emotional support.